The District of Sechelt is referred to as the heart of the Sunshine Coast, partially because of its placement on the 84 km coastline but also for the concentration of amenities in the municipality. Sechelt sits about 26 km West of the Langdale Ferry terminal and about 53 km East of the Earls Cove Ferry terminal. The District is bordered by the Strait of Georgia and Sechelt Inlet and more than 9,500 people call the area home. 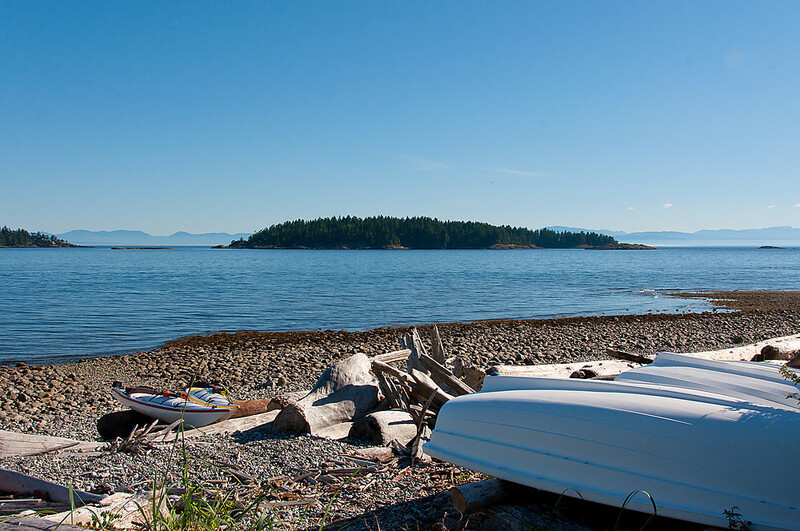 Sechelt got its name from the shíshálh First Nations people in the region and it means land between two waters. Sechelt is home to the Coast’s only hospital, which recently underwent a $44.15 million expansion and upgrade. Sechelt also has an ice arena and aquatic facility complete with a full gym, a youth centre, a racquet club facility, a public library, an arts centre, a botanical garden, a community resource centre, a golf course and a seniors’ centre. It’s also home to the Sunshine Coast RCMP detachment, a courthouse, a volunteer fire department, a food bank, an employment centre and a government agent’s office. There is a plethora of outdoor recreation options in Sechelt from skiing atop Dakota Ridge to kayaking in Sechelt Inlet and everything in between. Take advantage of one of the dozens of hiking or biking trails around Sechelt, visit one of the provincial parks or stroll the seawall in Sechelt or Davis Bay to take in some of the natural beauty the area is known for. You can hit a ball at the Sechelt Golf Course, play some tennis at the court in Hackett Park, organize a ball game at one of Sechelt’s many ball fields or play some volleyball at the sand court near the Trail Bay waterfront. You can also ride your skateboard at the Skatepark or get some air on your bike at the Sechelt pump track. In addition to outdoor options Sechelt has an aquatic facility, work out facility and ice arena for people to enjoy as well as an indoor racquetball facility. Sechelt is spread out, but connected by Highway 101, which is serviced by Sunshine Coast Transit. There are also some feeder bus routes into West Sechelt and West Porpoise Bay. The District of Sechelt continues to install bike lanes where they can to encourage residents to pedal were possible. The Sechelt area was settled by the shíshálh people thousands of years ago. The First Nations people were drawn to the area for its mild temperatures and abundance of food found in the forest and the sea. Europeans moved to Sechelt in the 1860’s and brought with them industries like fishing and logging. Tourists soon took notice of Sechelt and flocked to the area in Union Steamships. In those days Sechelt had a bustling waterfront but a devastating fire in 1914 took out the town’s only hotel. Over the years the waterfront has been redeveloped to include a mix of residential, public and business establishments, as well as a public walkway along the seawall. 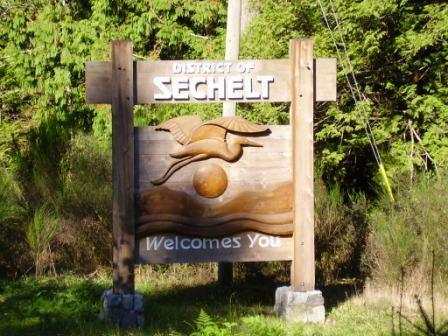 The Village of Sechelt was incorporated in 1956 and it became a District in 1986 when it expanded to include nearby areas Selma Park, Davis Bay and Wilson Creek. The District of Sechelt now encompasses about 40 square kilometers of land and is home to more than 9,500 people. School District No. 46 maintains one high school, three elementary schools and a learning centre in Sechelt. In addition there is a university, a private French school and a Christian school in Sechelt. Capilano University is situated in downtown Sechelt on Inlet Avenue and it offers courses in business, early childhood education, English and health care, as well as some specially designed Sunshine Coast courses. Chatelech Secondary School serves students in Grades 8 -12 on a large campus near downtown Sechelt. The school offers a recognized drama and French program in addition to regular courses and electives. Kinnikinnick is a community that honours the uniqueness of all. Kinnikinnick Elementary is proud to be the center for learning within the Sechelt Community. Approximately 200 students enjoy their well equipped school, a large playground and field, community learning gardens and many play structures. Kinnikinnik staff focus on a love of learning and living, and a desire to contribute to the well being of family and community and our planet. Located in the community of Davis Bay next to Chapman Creek with its extensive walking trails, natural learning opportunities and the waters fo the Salish Sea a short walk away, the school welcomes approximately 100 students to its programs. Three distinct school programs are offered:"regular mainstream" school: a Nature Program with a focus on environmental connection, and the Spider Elementary Home Learners Program. Davis Bay staff value the participation of parents in the learning community in the classroom inside and outside, on field trips, and as part of the Community Reader Program. The Gibsons Christian School kept its name when it moved to Sechelt. Serving students from Kindergarten to Grade 12 the Christian school next to Davis Bay Elementary is the Coast’s only faith-based school. The Sechelt Learning Centre is located on Cowrie Street in downtown Sechelt and it houses a number of early learning programs geared toward children from birth to age five. The free programs offered by School District No. 46 at the learning centre include SPARK! ; the Imagination Library; Ready, Set, Learn; KinderSPARK! ; the immensely popular TinyTown; and StrongStart. A Learning and Parenting Together program for teen parents working towards graduation is also in this location. Ecole du Pacifique is a private French first language school serving students from Kindergarten to Grade 12. The school is located just behind the Sechelt Learning Centre in downtown Sechelt. Chatelech Secondary serves approximately 530 students in Grades 8-12. The beautiful campus overlooks the District of Sechelt. Student success and opportunity is always the focus for the staff who offer creative solutions to meet all needs. The school has excellent facilities for the arts and technology, physical fitness tint he large gym and extensive playing fields. Creative grade structures and other initiatives help support all students.